Many risk factors for disease are suggested as screening tests when there is no prospect that they could be useful in screening. 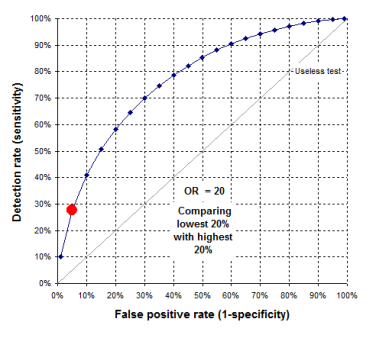 To avoid this it is useful to know the quantitative equivalence between the value of a risk factor and its screening performance in terms of the detection rate (sensitivity) for a specified false-positive rate. Here is an interactive risk-screening converter that does this. It is intended for people engaged in research into risk factors and disease and for those who give advice on applying such research findings into medical practice. It should help to distinguish effective screening methods from relatively ineffective ones and so improve clinical guidelines relating to screening and the prediction of disease. Wald NJ, Morris JK. Assessing risk factors as potential screening tests. A simple assessment tool. Arch Intern Med 2010. Download the risk-screening converter here.